Friday, July 19, 12 p.m.-7 p.m.
Saturday, July 20, 10 a.m.-5 p.m.
Sunday, July 21, 10 a.m.-5 p.m.
Janet Gillis is thrilled to attend the CAMF for the first time. Living in Rochester, and vacationing in Canandaigua, Janet has been wanting to revisit the area and the CAMF came at just the right time. The medium she most uses is sculpture, which are in her jewelry designs. 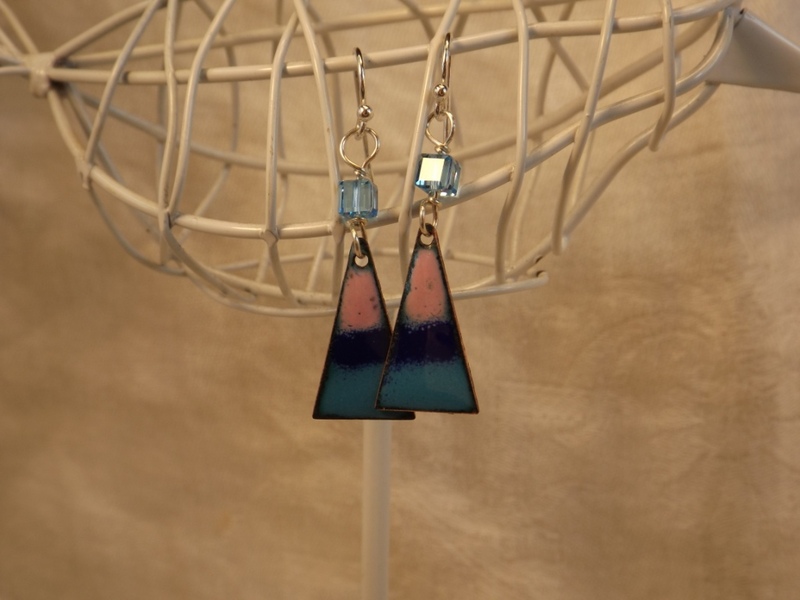 She loves to paint and her love of watercolor, the openness and airy design in Japanese watercolors is translated into her jewelry. Janet uses recycled materials for renewed use in jewelry and other art products. The art and design in wire work, including copper and sterling silver wire, natural stones, crystals and shells all are a way of designing her jewelry. Using geometric designs, balance, and negative space all help to create her airy, lyrical necklaces, earrings, bracelets and rings. Janet likes to use recycled materials because there is already too many wasted materials in the environment right now. She recycle purses, hats, picture frames with lace, jewelry, and lake shells made into flowers. This is her way of helping keep our earth cleaner. If there is one thing Janet has learned through her art it is always to encourage people to create and learn to express themselves through arts and crafts. A newcomer to the festival, Patty Cancilla is excited to join because she has always loved the area and vacations in Canandaigua every year! Patty came up with her work because she wanted her jewelry to be unique from everything else out there. Patty has learned that through her work that people like things that are different. Women do not want to see the jewelry they wear on other women. She wants women to feel good about the piece when they wear it, to be complimented, and to know they received a good value. Patty uses a technique called wire wrapping where she takes Sterling Silver & 14 kt. Gold-filled wire to create a one of a kind pendant, bracelet or earrings. It’s a technique she can do anywhere, and allows her to work when travelling. She didn’t want to use solder or heat because she creates jewelry out of fragile items like opal, cameo or shells, as well as stones, gems and beach glass. People can even bring vintage china and Patty will set it into lovely heirloom pieces of jewelry. Working in this medium produces a relatively affordable piece. For example, 14kt gold fill & Sterling Silver allows for a long lasting valuable piece without a heavy price tag. Patty works out of her home in Grand Island, NY and displays in the art festivals around Western NY. Her website www.PattyCancillaArt.com has a list of other shows she plans on attending. InSpiraled – Amazing Art You Can Wear! Among the awesome art booths coming to the Canandaigua Art and Music Festival this year, you will find InSpiraled by Becky Blair. Becky makes leather jewelry by hand and adds sterling silver, semi-precious stones and found objects (like vintage hardware) to create her pieces. They are riveted together and the results are wearable artwork. Ideas For Studio & Works: Becky has a studio in Corning, NY, as well as Charlotte, NC. Both of the studios have personal belongings that mean a lot to her. As for her artwork, she describes herself as someone who has always been passionate about recycling, upcycling and refurbishing, LONG before it was “popular,” and her interest in her artwork shows. Mediums: Becky uses all sorts of mediums to make all sorts of artwork: paintings, art dolls, clothing, jewelry and sculpture. She has shelves, cabinets, drawers, and tackle boxes full of beads, fabrics, leather, metals, shells, buttons, and antique finds – nothing is off limits! Inspirations: The color of the sky at a particular moment, finds from antique stores, beach walks, conversations with friends, obscure quotations, and various stumbled-upon color palettes are just some of the many inspirations Becky recalls. What to Expect at the Festival: She is never not working on something, so be prepared for anything! Where to Find Her Creations: You can find InSpiraled artwork at www.inspiraled.com or on Becky’s Etsy site (inSpiraled). You can also make an appointment to visit either of her studios. What Her Art Taught her: Becky’s art is always changing, but always staying the same because it is from her heart. Double Trouble when it comes to one of our festival artists – 2 Crocked Pots! Roland (often referred to as Cub) and Pam are visiting the Canandaigua Art & Music Festival to show off their collection of beautiful pottery and jewelry lines. We wanted to know a little more about their designs, so we caught up with them. Artwork: Cub has always loved painting, and flourished when he discovered his passion for creating art on clay canvas. Cub allows the natural beauty of the clay to serve as a backdrop for his lovely floral, art nouveau, and whimsical patterns. 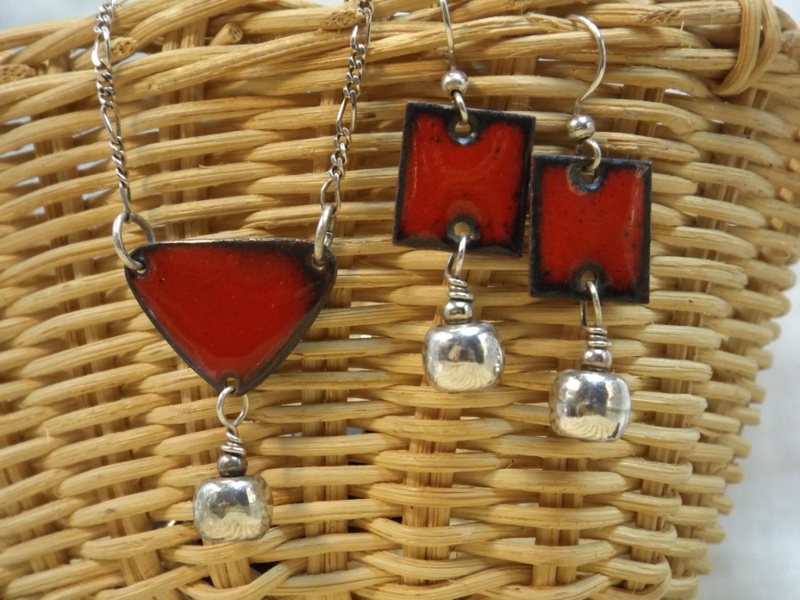 While Pam contributes to creating the pottery, she has also created her own jewelry line. Pam starts with stoneware and porcelain focal points she had glazed and adds glass and metal components that move her. Her different styles of wearable art are described as whimsical, earthy, simple and classic designs to please every shopper! Inspirations: Cub’s inspiration for the pottery stems from his childhood memories growing up in the Finger Lakes region. One of his most intricate creations is his “sailing” design. Time Commitment: These pots are wheel thrown, air dried, fired to a bisque, painted and glazed, and then fired one final time to bring out the color. Most of the pieces are hand painted, which usually takes 3-4 hours. Where to Find Their Work: You can find 2 Crocked Pots at many art shows throughout the Finger Lakes region and at www.2crockedpots.com! The studio is open at their patron’s convenience. What Art Taught Them: Art is constantly evolving. Cub and Pam love to experiment with new ideas. Sometimes it works and sometimes it doesn’t – but every piece is an experience! Jewelry exhibitor Lorraine Frelier wrote a guest post for our blog – going back to her earliest inspiration and giving an inside look into how she creates her pieces. I’ve always been creative. My first love was sewing, which my mother taught me. I also love needle work, especially embroidery. This taught me patience, to follow directions and determination. I’ve made several quilts and love the colors and textures found in vintage linens, quilts, curtains and drapery. One of my pastimes as a kid was untangling costume jewelry found on my mom’s vanity. I wondered at how they were put together and how they were made. As I got older, I would go to flea markets, yard sales, church bazaars looking for antique, vintage and unusual things to wear and bring into my home. I’ve refinished lots of furniture, which my mother also taught me, and have repurposed many of my finds. I started making jewelry from some of these found items. I made pearl bridesmaid necklaces for my wedding party from some of these things. This was the seed to Carriage House Creations. As I stayed home with my growing family, I found outlets for my creative interest. I was also making jewelry for myself and friends and thought I could sell some of my things. I was inspired by a vendor I spoke to at an arts festival. I originally made my jewelry upstairs in my 1870s carriage house, giving my budding business a name, Carriage House Creations. I have since moved to the basement in my home and have two kilns, a work bench and great storage. Like many jewelry artisans, I started with found items and craft store jewelry findings and beads. Through the internet the availability of more varied and better quality materials became much easier to obtain. As beading became more popular and the cost of silver went up, I noticed an increase in copper items featured in magazines and on some of the web sites I used. I recalled growing up in Ithaca and my 6th grade art teacher, Mr. Dobert, teaching us to enamel! I still have the piece. This art form uses copper and I thought enameling would be something unique. So, off to the library to find every enameling book published in the 1970s. YouTube was also helpful. I find a real joy in creating my jewelry pieces using simple materials: powdered enamels, raw copper and a high temperature kiln. The creative possibilities are endless. It’s a very involved process containing many steps to successfully finish a piece. I shape the copper, clean it, decide how it’s to be fastened, enamel several times to get different effects. I incorporated these pieces with jewelry findings, some that I create and other I purchase (like chain) to make unique jewelry. My jewelry reflects some of my beliefs. Not everything happens as planned and some of the most interesting things happen by chance. There are so many variables in both the enameling process and in life itself, things do not always come out as expected. I believe you need to be open to unexpected outcomes and always look for the “silver lining.” I love the uniqueness of each of my pieces. By using basic, simple scaled down materials – raw copper, powdered glass and fire – I’m creating timeless pieces of jewelry. I think the pieces have a unique, relaxed and comfortable feel to them. I’m very excited I was chosen to participate in this festival this year. I have participated in the past and have really enjoyed the festival. My jewelry can purchased at Cheshire Union, just south of Canandaigua, Mendon Fountains and Flowers in Mendon and a new shop, Creations Gifts and Treasures, in Pittsford along the canal, in Northfield Commons.